The Chicago Book Online Business Profile -- Chicago Waterjet, Inc. While working for his previous employer at a manufacturing trade show in 1999, Patrick Hill had an epiphany when he discovered a machine tool that utilizes high pressure water, mixed with abrasives such as crushed garnet, to cut through virtually any material. This machine is an abrasive waterjet, and it would forever change his career path. After seeing abrasive waterjet for the first time, he knew this would be a more cost effective way of producing not only single prototypes, but numerous production runs as well. The following year, Hill and a business partner started Chicago Waterjet Inc. with one machine. 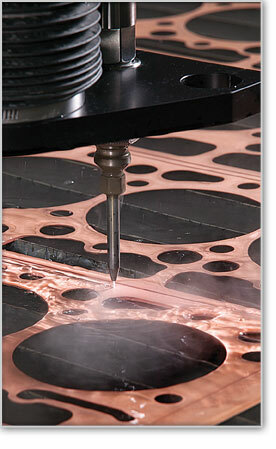 Twelve years later, Chicago Waterjet operates six water jet machines over a seven-day schedule. Hill explained how abrasive waterjet machining requires less setup, and offers lower production times over most other conventional cutting methods. It also offers a better material yield. "Most customers need things in a hurry and fast turn around is our specialty. We are one of the few machine shops dedicated exclusively to abrasive waterjet machining and this allows us to get the job done quickly." The company produces parts for hundreds of customers in industries such as automotive, motorsports, food processing, medical instruments, aerospace and architectural, as well as marketing and advertising. Hill attributes the success of his company to people behind the machines. "Everyone at Chicago Waterjet knows a customer is depending on them to meet a deadline. Our personal attention to detail and commitment to 100% customer satisfaction is the cornerstone of our customer service."